The goalkeeper kept a clean sheet against Leicester, and the club’s sponsors delivered on their promise. Neal pictured with his free pizzas before today's game. 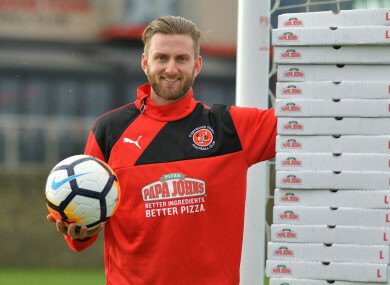 CHRIS NEAL HAS helped Fleetwood to an FA Cup third-round replay with Leicester, following a 0-0 draw, and himself to a year’s supply of free pizza. The 32-year-old goalkeeper lined up against the Foxes on Saturday knowing that a clean sheet would earn him more than just personal pride. Shutting out the Foxes was always going to give Fleetwood a shot at claiming a notable scalp, with a day out at the King Power Stadium the very least a blank scoresheet would secure them. For Neal, though, there was the promise of free food for the rest of 2018 to think about. As part of a pre-match promotion, Papa John’s — who were announced as Fleetwood’s sponsors prior to the game — offered the Cod Army star a rather intriguing incentive to perform well. Neal said of the offer: “It should be a great occasion for our fans and I’m hoping to do my bit for the team by keeping a clean sheet and earning myself some Papa John’s pizza in the process. Fleetwood’s frontmen failed to deliver on that part of the deal, meaning that Neal can now claim his prize all for himself. What a professional footballer will do with a year’s supply of pizza remains to be seen, with there strict fitness regimes to think about. Neal, though, can now dine out whenever the mood takes him, with the takeaways at Highbury Stadium on him for the remainder of 2018. Email “FA Cup heroics deliver Fleetwood star Neal free pizzas for a year”. Feedback on “FA Cup heroics deliver Fleetwood star Neal free pizzas for a year”.